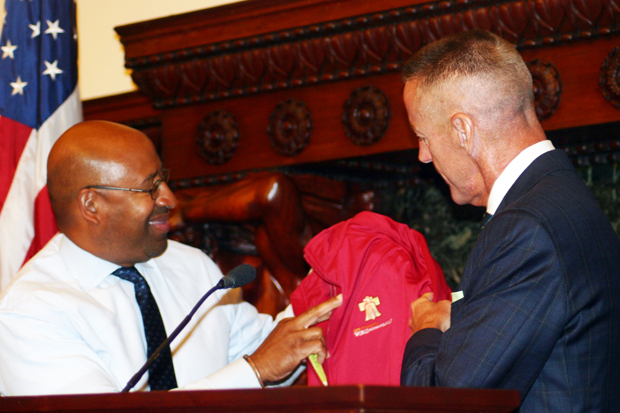 Mayor Michael Nutter, left, trades his suit jacket for a bright red World Meeting of Families jacket, courtesy of Aramark Corp.'s Ceo Eric Foss, June 1 at Philadelphia City Hall. Some of the more than 200 items available in late June include these collectibles. 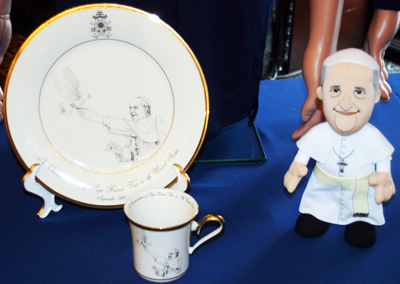 More than 200 items emblazoned with the World Meeting of Families logo or Pope Francis’s smiling face will soon be available to purchase as keepsakes for the historic congress and papal visit to Philadelphia this September. 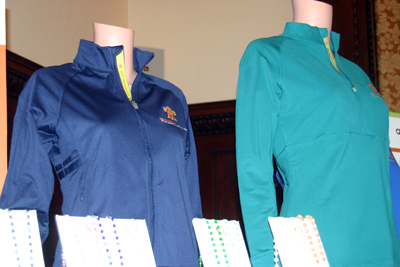 A representative sampling of the items were on display at a press conference Monday, June 1 in Philadelphia City Hall at which Aramark Corp. was announced as the official vendor of retail merchandise for the events in Philadelphia this September. Apparel including polo shirts, T-shirts, track-style jackets and caps were displayed alongside household items like wine goblets, key chains and decorative dinner plates, plus devotional rosaries, crosses and prayer cards of many styles. World Meeting of Families officials expect the items to be available for online shoppers on the website shop.worldmeeting2015.org by late June. They will also be sold at the Pennsylvania Convention Center during the families’ congress, Sept. 22-25, and at retail kiosks along the Benjamin Franklin Parkway in center city during the visit of Pope Francis Sept. 26-27. The Philadelphia-based food services giant Aramark already has committed to providing food and volunteer uniforms during the September events. The global company with 10,000 local employees serves the major sports stadiums in Philadelphia and its international food services business is supported by 240,000 employees worldwide, according to Aramark’s CEO Eric Foss, who spoke at the June 1 gathering. Co-chairman of the World Meeting of Families, Mayor Michael Nutter, also made an easy visit to the gathering since his office in City Hall is on the same floor. 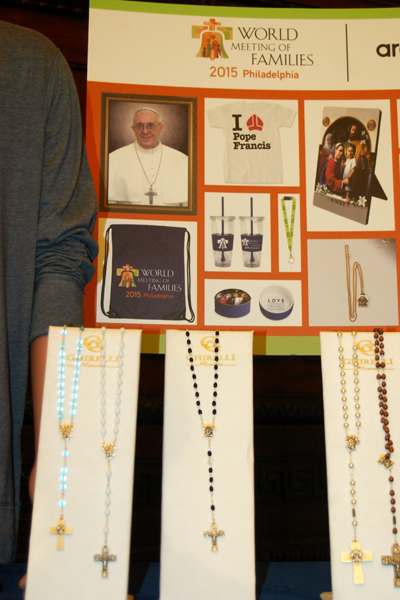 Rosary beads were just some of the religious articles emblazoned with the World Meeting of Families logo or Pope Francis’ image on display June 1. I think the “pope doll” is an insult to the Holy Father.